OLYMPIA – With Thursday’s ruling that the Legislature finally has done right by the public schools, the Washington Supreme Court seems to have satisfied most of those involved, possibly because lawmakers won’t have a giant sword named McCleary suspended above their head every January when beginning work. The decision generated some talk in the hours after it was released that this is only the beginning, the mere basics of education which the state must provide, that lawmakers must now work to go beyond to even better programs for better education. But also there was some partisan jousting that spoke to the political value of education. After all, children are our future. Just ask any candidate who filed for office last month. Why 2013, you might wonder. That’s when Senate Republicans were joined by a couple of disgruntled Democrats to form a ruling coalition in the chamber. Senate Democrats touted the fact they were in charge this winter, thanks to a one-seat shift in power, when the last piece of the puzzle – money for the full raises to school staff that the court said couldn’t be delayed for a year past the deadline – was jammed into place. They claimed credit for getting the court off lawmakers’ collective backs. Actually, the Legislature had failed to fully fund schools for years before that. The McCleary case was filed in 2007, and the trial court ruling came down in 2010, at a time when Democrats held nearly two-thirds of the Senate and the House. Those majorities were whittled away over the years, but Democrats always controlled the House during that period, and the budgets passed as the Legislature struggled with McCleary to have enough bipartisan support to pass both chambers and get a Democratic governor’s signature. Republicans were fond of pointing out during McCleary debates that public schools hadn’t topped 50 percent of the state operating budget since 1983, which is the last biennial budget a Republican governor signed. But while a Democrat has been in the governor’s mansion since 1985, both parties have held majorities – sometimes large, sometimes minuscule – in one chamber or the other over the previous 35 years. The House was evenly split 49 to 49 for three years around the turn of the century. It would seem there is more than enough bipartisan blame to go around for getting the state into its McCleary mess, just as there is bipartisan credit to spread around for pulling the state – however slowly – out of it. A month before the court’s ruling, a group of Republican lawmakers who took umbrage at a speech Justice Mary Yu made to a teachers union gathering in Spokane decided to make that umbrage official. They filed a motion for her to be recused – fancy legal term for knocked off – the case for talking to a group with a case in front of her. There were 13 in all, with nearly half from the Spokane-area delegation: Reps. Joe Schmick, Mary Dye, Mike Volz, Jacquelin Maycumber and Matt Shea, and Sen. Mike Baumgartner. Through their attorney, fellow Rep. Drew Stokesbary, they claimed several good legal reasons, and the right, to ask to have her booted from the case. Among the reasons was that they could have their pay docked if this dragged on any longer. They also made the separation of powers argument, and cited portions of the Canons of Judicial Conduct that call for judges not to do anything to undermine their independence, integrity or impartiality like talking to a party to a case. The teachers union isn’t a plaintiff in the case, he said. It’s merely one of 440 groups that are part of the Network for Excellence in Washington Schools, a nonprofit corporation that is a plaintiff, and legally that’s not the same thing. “Alternative facts are not a valid foundation for court filings in this Washington,” he wrote. The state said it wasn’t weighing in, but its silence shouldn’t be taken as a sign it agrees with the legislators’ motion. Without comment, the court dismissed the motion. 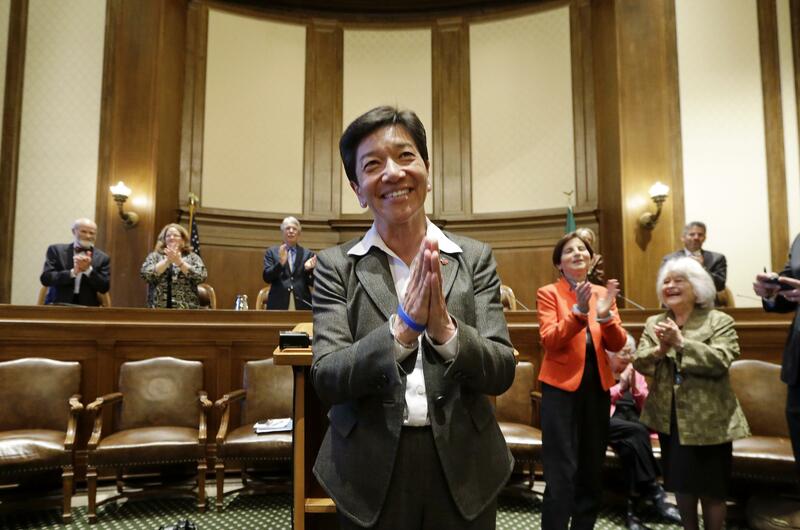 Yu remained on the case and signed the separate ruling that terminated the court’s oversight of McCleary and ended the $100,000 per day contempt penalties. That ruling, which was about everything legislators could have hoped for short of a free-round-of-beers toast to the end of McCleary, came down 9-0. Without Yu it would have been 8-0, which would’ve been pretty much the same thing.